No results recorded for this division. Welcome to the Cornwall County Short Mat Bowling Association website where you can keep up to date with the latest news from around the county and further afield. The website is updated as regularly as possible with results of County Competitions, Inter County matches and other news when provided. The CCSMBA is the governing body for Short Mat Bowling in Cornwall with over 60 registered clubs and 1000 affiliated members. The Association was formed in 1990 and affiliates members to the English Short Mat Bowling Association, the governing body for the sport in England. 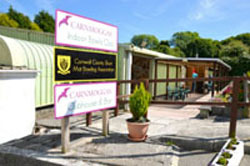 The CCSMBA home venue is Carnmoggas Indoor Bowling Club located on the Carnmoggas Holiday Park at Little Polgooth near St Austell with easy access from all parts of the county. We can comfortably set out eight mats for all our competition and Inter County Match match needs and the venue offers tea/coffee and bar facilities.